History is happening again, for this new container vessel for MSC will be the largest ever built (until her sisters hit the water, anyway), breaking the 400x60 m envelope, being the first ship with 24 container rows. I'll get her IMO number eventually. Daewoo and Samsung ships should be of the same size, even as there may be some minor design differences. Unlike Samsung ships, Daewoo ones are always launched with their superstructures. Is the Daewoo's ship larger than Samsung's ship? Is this ship 23,500 teu? 1st bridge-less autonomous ship. What a monster! Do you need full crane coverage at every port? Not with proper stowage planning. Or even at any ports if the ship can berth either port or starboard to quay at different ports? Thank you for your comment, my dear friend Volker. I'd say it's a gamble; the owners are building ultra large vessels expecting the ports to catch up. Hello Vlad my dear friend.Interesting shot. But...where should the ports for these giants come from!? Eventually it is over!! Cheers,Volker. She is 24x40' bays vessel, so she's still 400 m in length, but she is one row wider, therefore 61 m wide. Now we're talking Vlad (so to speak). Frans as far as I know she will still be 400m in length i.e. 24 40ft bays long (hard to count on this picture), but as Vlad mentioned 24 boxes wide for the first time. Is het length still 400 meters? because rumours are that MSC was building one off 420 meter. Please share any details of this type upon available. Thanks a lot for this first impression of how these new Megamaxes will look like! 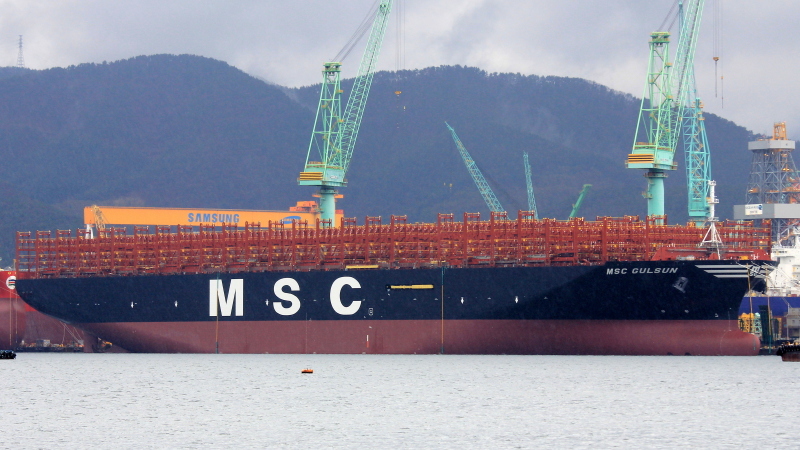 As MSC Gulsun is the first in series (Samsung 2248), her IMO is 9839430. This photo has been shown 2,804 times since it was added to the site.